Imagine a world where American car buyers understood the benefit of the wagon over the crossover, and a certain German carmaker didn’t ruin diesel for everyone. If you lived in that strange place you might want to drive the new BMW M550d xDrive Touring. You already know you can’t buy the wagon version of the all-new BMW 5-series because you are not a European scuba diver. But perhaps you are an international business executive and have the need for a suitable vehicle to pair with your loft in Munich. Well, my successful friend, BMW has the car for you. 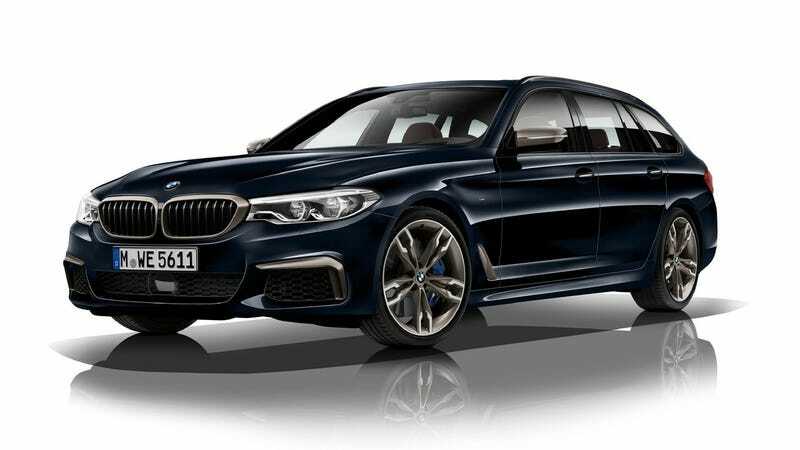 The M550d xDrive has not one, not two, but four turbochargers mated to a 3.0-liter inline six-cylinder diesel motor. It cranks out 400 horsepower and a massive 560 lb-ft of torque. Which, by the way, is more twist than the current generation M5. Because all that power is transmitted through an eight-speed automatic sports transmission and put to the ground via BMW’s xDrive AWD, the mighty wagon will hit 60 mph in 4.4 seconds. BMW claims the diesel wagon should return about 38 MPG on the highway. Of course the M550d being a kinda-sorta M car, it is also adorned with upgraded brakes, a sporty body kit, rear-wheel-steering, a quite sporting suspension, and 19-inch wheels. It is perfect for the executive who wants power and utility without being too showy, which is what people who did a lot of cocaine in the 1980s also said about BMWs back then. Brush up on your German and book some Lufthansa flights, because living in Europe is the only way you will be able to own this beast.